Game sf Swords slot's title immediately sounds like a rip off of the global hit TV show Game of Thrones. 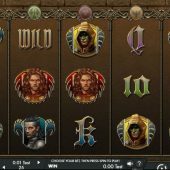 Having seen the limitations Microgaming had making their Game of Thrones slot, maybe its clear why Genesis Gaming avoided using the more famous name. Well, theme wise there are similarities with legend, castles and battles involved and a classical dramatic musical overlay to the game's 5 reels and 25 pay lines. The symbols are single and consist of various medieval characters like a Princess, Knight and other warriors. The remaining tiles are the usual card ones formed of classical lettering. There are scatters on all reels and Wilds appear on reels 2, 3, 4 and 5 with no multiplier. The 5 characters all pay 16x stake for 5-of-a-kind and the card symbols either 2.5 or 3.75x stake. There is an in-play feature to consider first. Usually Genesis Gaming slots are mono-featured and simply have one free spins bonus or pick me. Not here! Each character has his or her Coat of Arms above one of the reels, and it's illuminated if they appear on that particular reel. Light all 5 up in one spins and you get a sword battle whereby you get 4 lives and your foe 2. So, you pick a Coat of Arms to represent and you commence to battle each of the other 4 in turn. You pick from 3 moves: stab, upward and downward thrust and once vanquished, your enemy falls and onto the next level. If you lose your lives you collect awards accrued thus far, and should you defeat all 4 enemies you are given the Crown and all you cumulative winnings are multiplied 5x. Three or more Crown scatters awards 10 free games. You select a character again and this time the game selects one too which when appearing will transform into your character before wins are paid after any spin. If you land another 2 scatters, the game picks another character to transform into yours too, and so-on until possibly all characters are the one you originally chose. You cannot retrigger them and there are plenty of characters on the reels so you can see 2 or 3 on any reel. Effectively this limits the top pay with all characters conquered to 400x stake for a spin (25 x 16).